A heirloom Tiffany cigarette box that was given by the Duke and Duchess of Windsor to the Canadian owner of a yacht they rented 67 years ago was sold for $17,000 to a Western New York collector. Sixty-seven years ago, the former king of England took a one-week cruise in the Bahamas on a yacht he rented for $100 a day. But the former Edward VIII, known after his abdication as the Duke of Windsor, never had to pay for the rental. Instead, the Canadian owner of the Florida-based yacht, Joseph Dunkelman, waived the fee and he was given a very plain silver box – plain except for two things. It was made by Tiffany, and it bore engravings specifying that it was from the Duke and Duchess of Windsor. That box was sold at auction in Clarence on Saturday for $17,000. Kelly Schultz, whose Main Street auction house sold the box, wouldn’t disclose the identity of the winning bidder, except to say he was a Western New York collector. The bid arrived by cellphone. A Schultz employee held it to his ears and waved his arms as the price rose. The bidding started at $10,000, and lasted only 67 seconds. “We had a couple of dealers bidding on it. We actually had a gentleman from England who was doing some bidding on it,” Schultz said. The Englishman was among the competitors allowed to leave bidding instructions in writing. 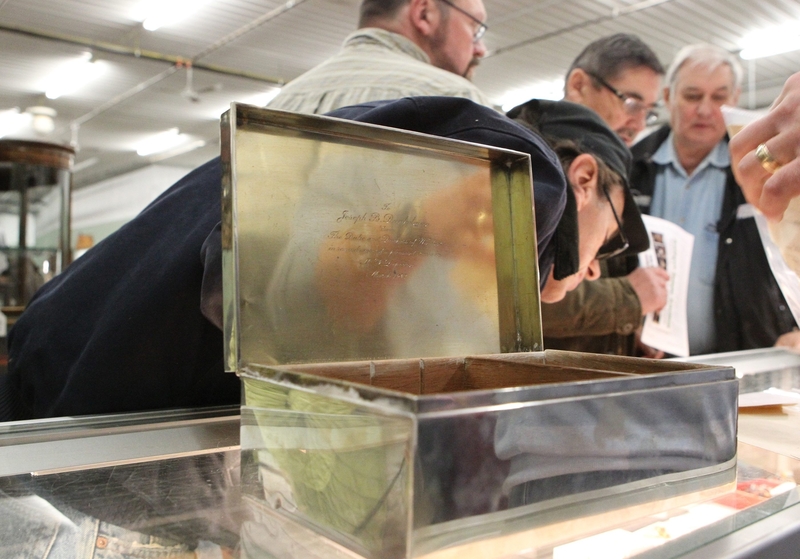 The silver box, designated as Lot 180A out of 694 offered for bidding Saturday, didn’t trigger much of a stir among the audience of about 150 gathered for Schultz’ regular auction of antiques. The room was filled with old furniture, posters, paintings and jewelry. Along with the box, the winner received the original one-page rental contract and a typed letter of thanks to Dunkelman, both signed by “Edward, Duke of Windsor,” and a small black-and-white photo of the Duke and Duchess, apparently taken just before boarding. The letter says the box was to be sent to Dunkelman in Toronto once it was engraved. “This is just a regular silver box. Without the provenance, this is probably $3,000,” Schultz’ son Ben Schultz said. Edward’s crest is inscribed atop the box, along with the Old French phrase, “Honi soit qui mal y pense,” which means, “Shamed be he who thinks evil of it.” It’s the motto of the Order of the Garter, the highest level of British knighthood, and also is used in the royal coat of arms. Edward VIII abdicated in December 1936, less than a year after becoming king, because he had fallen in love with a divorced American woman, Wallis Simpson, and as head of the Church of England, he was not allowed to marry a divorcee. The abdication placed Edward’s brother on the throne as George VI; he was the father of Queen Elizabeth II. Meanwhile, Edward and Wallis were granted the titles of Duke and Duchess of Windsor. During World War II, the Duke served as governor of the Bahamas, making it a familiar place for him to take a cruise. The silver box was placed in a storeroom until the bidder comes to pay for it. He will have to pay Schultz an 18 percent buyer’s premium, or $3,060, on top of the bid price. Dunkelman’s son, who offered the item for sale, will pay Schultz a commission, but at last, the family will receive cash for the rental of the yacht in 1947.